Red rocks dominate most of the landscapes around Moab; away from the well-known Arches and Canyonlands national parks are many other scenic areas, centered on the Colorado River. West of town, the 15 mile Potash Road passes arches, side canyons, and lengthy stretches of sheer cliffs, while to the east, the longer Hwy 128 follows a wide valley containing larger expanses of sandstone formations. 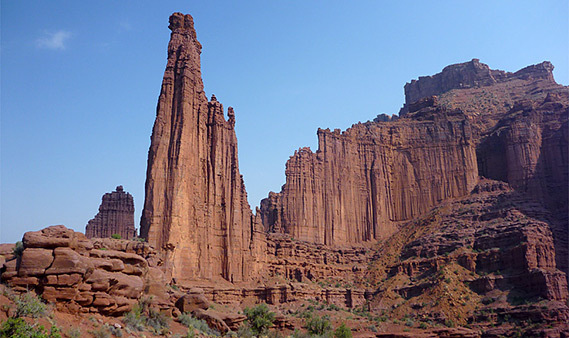 These include Castle Valley, lined by isolated buttes and spires, somewhat reminiscent of Monument Valley, and also the Fisher Towers, a group of unusual vertical cliffs and pinnacles, which are eroded into jagged shapes on the top and grooved down the sides. The cliff faces are partly covered by dried red mud, creating a strange texture similar to that found in some other Southwest locations like Cathedral Gorge State Park in Nevada. 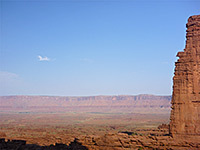 Below the towers stretches an uneven landscape of hoodoos, terraces and narrow ravines, all colored rich red, formed of two sedimentary layers, the Cutler Formation and the overlying, and more resistant Moenkopi Formation. The towers are a renowned rock climbing location but most visitors explore only on foot, via a maintained, 2.2 mile trail which winds around the base of the cliffs then tracks south to a fine viewpoint at the end of a narrow ridge, looking down on a deep ravine below. 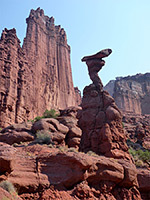 Camping (not free) is also available at the trailhead; a very scenic location with views of the towers directly above, and across several miles of flattish desert towards high red cliffs on the far side of the Colorado River. 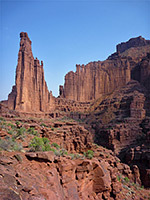 The Fisher Towers are reached by a short (2.2 mile), somewhat bumpy vehicle track that climbs quite steeply near the end, and leads to the BLM trailhead and a five site tent campground (fees $15 per night in 2015). The track is signed from the highway. Free, primitive camping is available about 15 miles away at the south end of Castle Valley. The trail also climbs for most of the way, not too steeply, but gaining another 600 feet during its 2.2 mile length, mostly following upwardly sloping benches at the base of the towers. It starts, however, with a short descent, into a drainage that is dry most of the year, but green bushes along the edges hint of seasonal springs upstream. The path leads up the far side and around two more drainages, at one point running beneath two shapely hoodoos, each topped by a balanced rock, then turns a corner and moves along the base of a vertical wall - above rises one of the larger pinnacles, named Cottontail Tower. 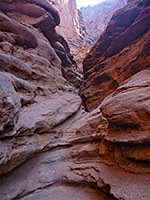 The route continues round the head of a fourth drainage, where it is aided by a short ladder up one side of a little slot canyon; next is a fifth ravine, after which the path continues south, along the top of a narrow ridge to an overlook at the far end, high above Onion Creek. 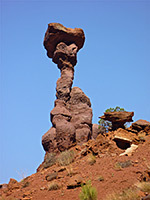 This is a deep, branched wash that may be accessed (from below) by a rough vehicle track. The fifth drainage runs beneath a narrow fin that terminates in the highest part of the towers, a stout spire named the Titan. Although the path ends at the ridge, walking further east is easy for a little way, around the edge of the next ridge (to the far side of the Titan), but a deeper, wider canyon just beyond makes further travel rather more difficult.